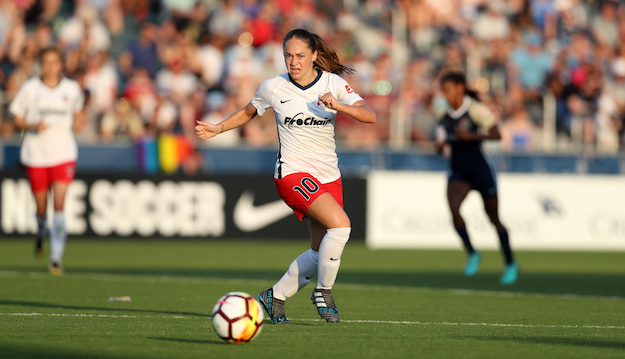 Yurcak Field – Piscataway, N.J.
Boyds, MD (June 6, 2018) – The Washington Spirit head back on the road, looking to bounce back and end their two-game losing streak as they visit Sky Blue FC on Friday night. Kickoff is set for 7:00 p.m. at Yurcak Stadium in Piscataway, N.J. and is available to stream at go90. This will be the second matchup of the 2018 NWSL regular season between the Spirit and Sky Blue FC. The Spirit took the first game in a 1-0 win on May 23 at the Maryland SoccerPlex. Forward Ashley Hatch scored the game-winning goal in the 64th minute, while goalkeeper Aubrey Bledsoe stopped all four shots faced for her second clean sheet of the season. After losing 2-0 in a rain-soaked game against the Chicago Red Stars on Saturday, the Spirit will look to get their offense back on the board. With Rose Lavelle (USA), Francisca Ordega (NGA) and Rebecca Quinn (CAN) out of the lineup due to national team duty, Hatch (3 goals, 1 assist), Estefania Banini (1 goal) and Andi Sullivan (1 assist) will aim to lead the attack. Hatch, the 2017 NWSL Rookie of the Year, has tallied two goals in her last three games, while Sullivan recorded her first NWSL assist against Sky Blue FC during their last matchup. Sullivan has played the full 90 minutes of all 11 Spirit games this season. Heading the defensive front for the Spirit are Taylor Smith, Caprice Dydasco, Whitney Church and Estelle Johnson. Smith, Dydasco and Church have each started all 11 games for Washington this season. Between the posts, Bledsoe has started 10 games for the Spirit and leads the NWSL in save with 50. The Washington defensive corps successfully shutout the Sky Blue FC offense during their last matchup, but will still have a tough task ahead of them. With two of Sky Blue FC’s top offensive threats out due to U.S. Women’s National Team duty – Carli Lloyd (1 goal, 1 assist) and Savannah McCaskill (2 goals) – the Spirit will focus on stopping forward Katlyn Johnson (2 goals, 2 assists). Johnson has two goals and one assist while playing at Yurcak Stadium this season. Washington will look to record their first road win of 2018, trying to snap this season’s five-game winless streak on the road. Sky Blue FC enters Friday’s game still looking for their first win of the 2018 season. The team suffered a 2-1 loss in their last game against the Utah Royals FC.